It took me by surprise. I was eating dinner with my roommate and we got to talking about our developing yoga practices and she started pointing out muscles that have been changing, and then she turned to me. Look at your muscles, and, for the first time in two or so weeks since I have really poured myself back into my asana practice, I took a look. And bang. I don't usually post photos of my biceps, but then again, I've never been the guy with the big guns (don't worry I won't become a meathead). I've always been teetering on the edge of satisfied and remiss with regards to my body image, remaining committed to my own regime or non-regime or what have you. I never took to weight training as I thought it was unnatural; I've always believed that to be truly in shape I'd rely solely on my own body and its weight. I grew up eating pretty healthy and leading an active enough lifestyle, running in highschool before finding yoga in college; I've always been lean and slim. So mid-cleanse at the beginning of this month, something just clicked. With a renewed dedication to founding health for my body, I clicked right back into my yoga practice which had lay fallow for quite a while. Finding a motivating local teacher was definitely another key factor in the equation. And now, not focusing on the end goal of getting muscles but instead revved about the meditative aspect and the breath/space/strength awareness of the yogic practice in concert with a vegan, gluten-free, sugar-free and alcohol-free lifestyle, I find myself getting results I didn't think possible. BAM. Part of me is still a bit in awe of the transformation. Somehow body conception vs. the actual image of the body haven't always met up at the same point in my life. 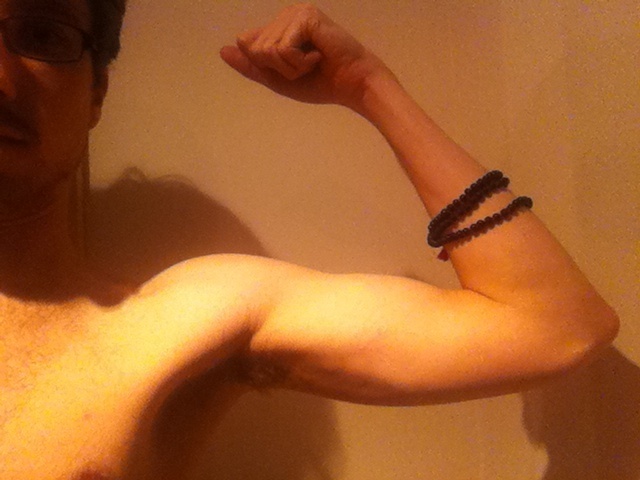 Regardless, I am definitely superbly in tune with my body more than ever before. And it shows. If it all feels good and this is what happens? I'll take it.